Whilst I totally understand why Quentin Tarantino is an inherently divisive figure - let's face it, Aspergers Syndrome and cocaine are a pretty polarizing combination - the fact that he's willing to run The New Beverly Theater as a non-profit museum of vintage and modern titles alike, exclusively on 35mm*, is one of those things that the man deserves a lot of credit for. The sold out Tuesday night show, their monthly Grindhouse Double Feature no less, happens to be Lamberto Bava's DEMONS and Sam Raimi's THE EVIL DEAD. The latter has been such a popular mainstay for so long it'd be disingenuous to suggest that it doesn't get shown as a "midnight movie" on a pretty regular basis, but I've never seen it on 35mm, so it's still new to me. 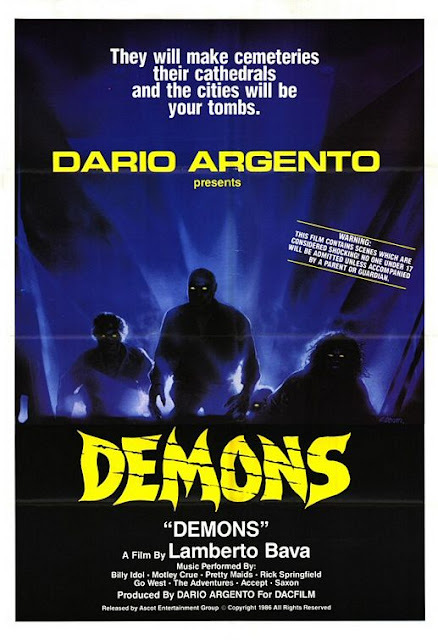 DEMONS, on the other hand, is a rare treat to say the least! I'll be paying close attention to the "look" tonight, as I did with both Suspiria and The Burning when I saw them on 35mm in the last year or two. I've actually never seen a 16mm blow-up on the big screen before either, so The Evil Dead will be an interesting experience... boy I hope that's a vintage print, not one of those "All New!" 35mm Answer Prints that totally defeat the purpose of watching a beat-up print from the time of release. For the record: Techniscope doesn't look as bad as you probably think it does. At least not if 1990: The Bronx Warriors was any indication. Holy hell, seeing that on 35mm was a treat. * They will play video sources, but only on very, very special occasions. The non-convention premier of the NIGHTBREED workprint was a great example... and holy crap did it look poor on a 30 foot screen. Agreed. I was lucky enough to see Bronx Warriors on the big screen up here in Ottawa, Canada a few years back. It WAS a rare treat!